Separation anxiety behaviors are very focused, occurring only when the pet is separated from her human. In dogs, they also seem frantic in nature and your pup may even show a disregard for personal safety, continuing even through injury to herself such as broken nails, scratches or cuts. A dog with true separation anxiety will focus her destructive behavior on windows or doors, or on attempting to get back to her human, such as escaping from a kennel. Or a dog with separation anxiety may exhibit her stress by eliminating in the house or through excessive vocalization such as barking, whining or howling. However, it is important to determine if the behavior is the result of an outside stimulus, such as cars driving by or the mailman knocking on the door or if it is truly the result of a mild separation distress or a true separation anxiety. At Critter Care Animal Clinic, we’re here to help! When dealing with behavior issues that could be attributed to separation anxiety or another factor, it is important to determine the root cause of the issue. Improperly diagnosing your pet as having separation anxiety can mean inappropriately addressing the behavior and increasing the frustration level for both you and your beloved pet while failing to resolve the behavioral issues. By the same token, misinterpreting your pet's separation anxiety behaviors for other behavioral issues could lead to the sad conclusion that your pet is not a good fit in your home and family and result in her surrender to another family or shelter, increasing her potential for developing true separation anxiety. The suspicion that your pet may have separation anxiety makes it important to consult with us at Critter Care Animal Clinic to verify the concern and set up a program to appropriately address the situation. Just as with many issues our pets face, there are a variety of options for treatment and alleviation of symptoms, such as behavior modification therapies, pheromone diffusers (Adaptil or Feliway, depending on your pet’s species) and other prescription options that are available in our clinic or through our online store. The main thing would be to ensure your furry friend is getting the treatment that is right for her level of separation anxiety and that it alleviates both her symptoms and the frustration you both naturally experience due to the situation. 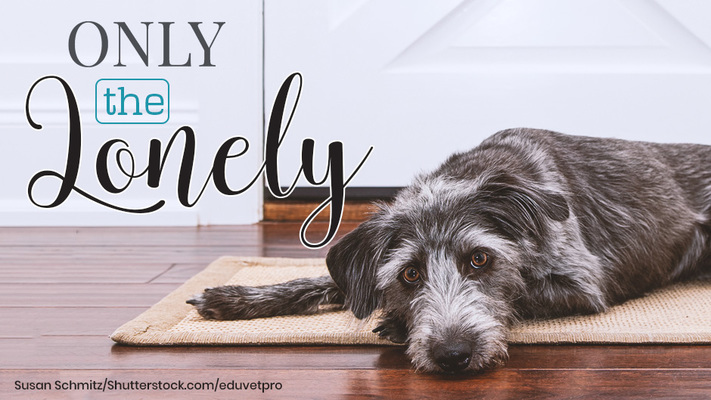 If your pet is exhibiting signs of true separation anxiety, we urge you to make an appointment by calling 920-458-3636 to discuss the issue and create a plan to ease her distress. It will take time and patience, but both you and your four-legged friend will be happier when she is able to tolerate being left alone.